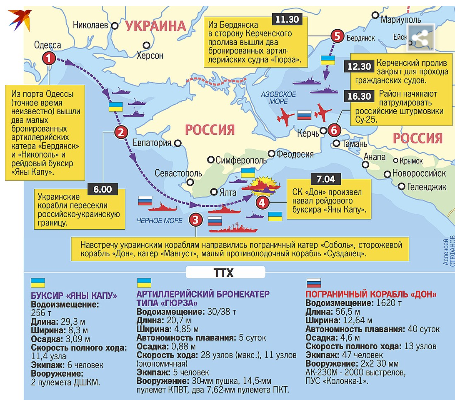 The FSB has issued a detailed chronology, with map coordinates, of the interaction between the Ukrainian Navy vessels enroute between Odessa and Mariupol, and the Russian Border Service. The sequence in time and space, and the locations, can be followed on this map, composed and published by Komsomolskaya Pravda. The FSB public bulletins can be read in the original Russian; the FSB does not translate into English. The chronology was reported on Monday, the day after the Sunday incidents. An English translation has been published here. As the Ukrainian vessels moved towards the Crimea Bridge across the Kerch Strait, Ukrainian officers on board two of the vessels were recorded as arguing between themselves whether they should proceed into the Sea of Azov without Russian permission. When they continued on course, the Russian Border Service reports more than twelve hours of warnings – from 0720 to 2055 – during which time Ukrainian ship commanders decided to run the gauntlet of the Russian escorts, breaking out of contact and their gun range. The first Russian warning shots were fired at 2045; when they were ignored, lethally targeted shots were fired ten minutes later. The Ukrainians surrendered and were boarded by the Russians by 2115. The three vessels and crews were then disarmed and escorted to Kerch port. Above: The Ukrainian Navy’s Gurza-M type shallow-draught patrol boats, at sea trials in in 2016; U174 (foreground) is the Akkerman, U175 (rear) the Berdyansk; note the angle of the ship guns. Source: https://defence.pk/ Below: the Berdyansk on Sunday after Russians boarded and disarmed her. According to the FSB chronology, after ignoring Russian radio warnings to stop, the Berdyansk and U176 Nikopol had raised their main gun barrels to 45 degrees and swivelled to point them at the Russian interception vessels. The FSB’s version of the bilateral treaties and Law of the Sea provisions applying to the sequence of Sunday’s events is included in the chronology. For a German and Ukrainian academic review of the legal provisions, read this. While allowing the possibility for Ukraine to claim rights of “transit passage” or “innocent passage”, the study does not address Ukrainian Navy movements or military operations. 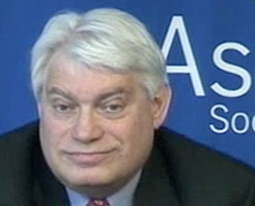 For “reply measures” the spokesman was warning Kiev of military force. Following the Sunday incidents and the FSB’s chronology, the Foreign Ministry extended the warning to the US and the European Union: “We are hereby issuing a warning to Ukraine that Kiev’s policy, pursued in coordination with the United States and the EU, that seeks to provoke a conflict with Russia in the waters of the Sea of Azov and the Black Sea is fraught with serious consequences. 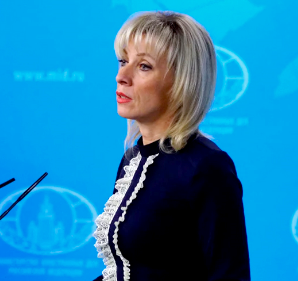 The Russian Federation will firmly curb any attempts to encroach on its sovereignty and security.” For “serious measures” and “curb attempts to encroach” the Ministry meant military force. The Defence Minister, General Staff, and the Navy have issued no press releases, although the FSB’s chronology confirms there has been coordination of operations with all the services, including the Navy and the Air Force. The Kremlin was not exactly silent about what collectively had been decided in the operations room during Sunday. On Monday evening, the Kremlin reported that German Chancellor Angela Merkel had telephoned Putin. During the conversation, according to the communiqué, Putin “expressed the hope that Berlin would use its influence on Kiev to stop it from taking further reckless steps. It was noted that the service personnel of the Russian Coast Guard were ready to provide additional explanations of the developments in the Kerch Strait.” For “explanations of the developments” the Kremlin meant military force. The American response so far has been wishful thinking. “We should remember that the United States went to war with Great Britain in 1812 because of such incidents,” thundered Stephen Blank in an Atlantic Council publication titled: “Russia’s Provocations in the Sea of Azov: What Should Be Done?” The Kyiv Post has republished it.